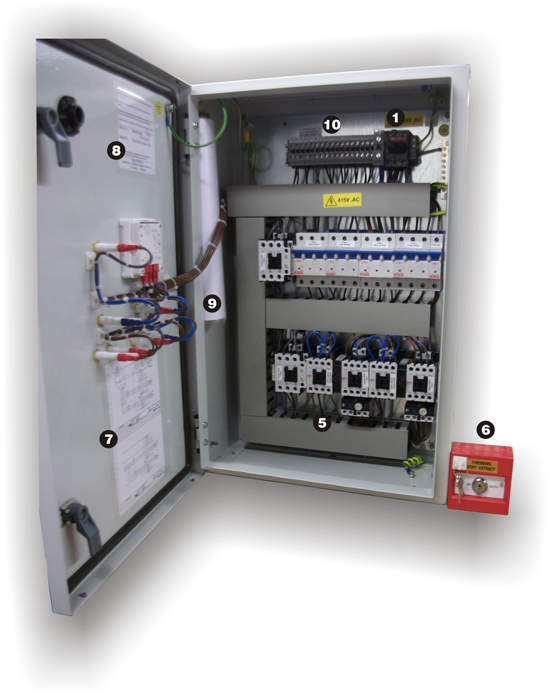 Sarum can supply bespoke smoke extract control panels to your individual requirements and specifications. Our HVAC systems engineers work with specifications from specialist consultants in a broad range of building types and industries. 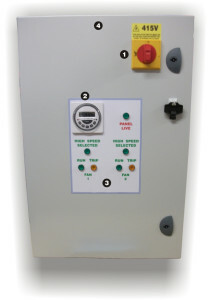 All our bespoke control panels come with a variety of optional components. Below is an example of a Sarum Electronics bespoke smoke extract control panel, designed to the individual specifications and requirements of one of our clients. This control panel was designed to control two smoke extract twin speed fans. In normal everyday conditions the fans would run at low speed, with the on and off times controlled by the facia mounted 7 day time clock. When the fire alarm was activated, the two fans would switch to high speed. The remote fireman’s switch could also be used to control the fans and the three position switch would allow the fireman to turn the fans off, switch to full speed or switch to auto control via the fire alarm. The control panel was supplied with a circuit diagram attached to the inside of the panel door, along with a circuit diagram and O & M manual supplied loose inside the panel. For more information on any of our bespoke control panels or to enquire about your individual requirements, request a quote or contact us by phone or email. Door interlocking isolator, to prevent anyone opening the control panel whilst it is still live. 7 Day time clock (can also be mounted remotely). Single door steel enclosure with removable gland plate for ease of drilling entry holes. Contactors and overloads for fan protection. Have a question about Sarum Smoke Extract Control Panels? Please fill out the form below and we will get back to you.